The Image Options inspector lets you change settings of selected images in the Storyboard/Timeline. You can make changes to multiple images at once by selecting several images in the Storyboard/Timeline before adjusting settings in the Image Options inspector. The Image Options inspector opens automatically when you double-click an image in the Storyboard/Timeline. When a single image is selected, the filename of the image will be displayed here. If you want to replace the image, while keeping all other parameters (animation, color, etc. ), select the Replace Media File... command from the popup menu next to the filename. You can also select Get Info to show info about the image file. When you replace an image in a slide, you may have to adjust the position and zoom factors for the new image. Use this feature to add a border to the selected image layers. Use the slider or enter a point size to set the width of the border. Click on the color swatch to the left of the slider to choose the border color. Use this feature to apply non-destructive color correction to the selected images. Color correction can be used to modify the color tint, saturation, and gamma (lightness) of an image. Click the Custom color button to open a popover. In the color wheel, click and drag the black circle to the preferred color tint, and use the saturation and lightness (gamma) sliders to adjust these parameters. The image in the Stage adjusts automatically as you make changes. 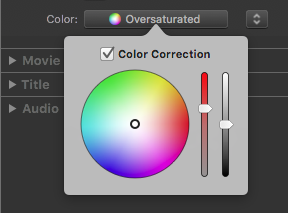 Check or uncheck the “Color Correction” checkbox to enable or disable the color correction. That way you can make a before/after comparison. In the popup menu next to the button you can select Copy and Paste to copy the color correction from one image to another, or Reset to remove color correction from an image. The effects of the color correction are visible live in the Stage and Storyboard/Timeline. If you have multiple slides selected, the Stage is empty and you can see only see the effects in the Storyboard/Timeline. If you have several images of matching color tint, but a few stick out with a different tint, you can select those images and adjust their tint to match the other images. To create a black & white version of an image simply reduce the saturation to 0%.